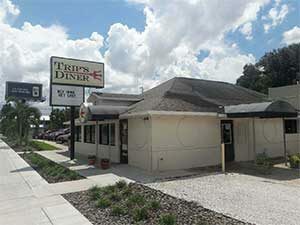 Opened on March 12th, 2012, Trip’s Diner has become a local favorite by residents of Seminole, St. Petersburg, and Seminole Heights Tampa, Florida. Named after the owners Triplets, John, Will and Libby Stevenson, Trips has become an all-day breakfast staple in many local households. Voted Best of the Bay for a good reason, customers keep coming back for American favorites such as southern cornbread, meatloaf and famous cheese grits. If you keep scanning the menu, you’ll find a wide variety of food from breakfast Cubans and Hubcap pancakes to smoked burgers and Philly cheesesteaks, but be careful, once you start eating you can’t stop. The attention to detail in the kitchen is why you cannot stop licking your fingers. When the owners Gordon and Louise Stevenson sat down to create a menu for the restaurant they both agreed upon one thing: simplistic quality made food. If you order anything off the menu, you can see they have kept these values throughout the years. Back in the kitchen you can see prep cooks preparing fresh food and creating homemade sauces in one corner. In another, cooks use old family recipes to create dishes such as Gammy’s meatloaf, Sarah’s corn bread and Louise’s pasta salad. If you’re lucky enough you can even smell the freshly baked cookies coming out of the oven, ready to be displayed up front taunting customers as they pay at the cashier stand. Overall, Trips offers an experience like no other and proves it’s one of the best Tampa restaurants.